Update: Warrants have been issued for the arrest of the owner of the building and the sign company responsible. See L.A. Times article. 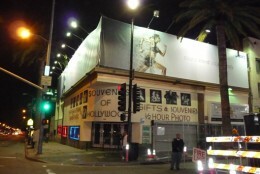 Our friends at Curbed LA were out in the middle of the night covering the removal of the giant supergraphic ad from the historic First National Bank Building on Hollywood Blvd., and they observed the fact that a new, albeit much smaller, supergraphic had gone up on a building across the street. Which raises the question: Should the City Attorney’s office, which engineered the weekend jailing of the First National Bank Building’s owner, also be going after the owner of the second property? The owner of record is Yorkbury Investments, 11611 San Vicente Blvd. According to documents in a lawsuit filed against the city in 2007, the firm’s managing partner is Mazen Nazzal. The identity of the sign company responsible for erecting the 8-story sign on the First National Bank Building advertising the Dreamworks movie, “How to Train Your Dragon” is apparently a mystery. However, the company putting up the sign for Asics running shoes on the three-story building across the street is known, because it sued the city in 2008 to block enforcement of the off-site sign ban at the site. That company, Community Redevelopment Association dba Liberty Media, also sued the city last year to overturn the no-exceptions ban on off-site and supergraphic signs adopted in August by the City Council. The company lost that suit, and this past December a federal court judge refused to enjoin the city from enforcing the ban on the Hollywood Blvd. property. Which means that the Asics supergraphic is clearly illegal. According to a 1998 article in the Los Angeles Business Journal, Yorkbury Investments had plans to tear down the existing building on the property and put up a 21-story Marriott Hotel. Nazzal and his partners purchased the property in 1982, according to the article, and at the time owned several hotels in the Middle East and London. City Building Department records show that citations for illegal supergraphic signs at the site were first issued in October, 2006. In the 2007 lawsuit by a Yorkbury Investments subsidiary, Yorkwood LLC, a claim was made that the property owners had “suffered severe emotional distress in being threatened with criminal prosecution.” A federal court judge dismissed that lawsuit in January of last year. See also: Historic Hollywood Building Gets Unpermitted Supergraphics and L.A. Businessman Agrees to Remove Hollywood Supergraphic.